It was broad daylight in midtown Manhattan when Julio Nivelo spied the prime opportunity of his decades-long career in crime – the Super Bowl, as he called it, of get-rich-quick heists. A large black pail sat in the back of an armored truck, unmonitored, as oblivious New Yorkers hurried past, its two guards momentarily separated. He doubled back and watched as one of the guards walked away from the back of the truck. Wearing his lucky Rag & Bone sneakers – his “golden shoes” – he snuck softly onto the metal lift off the back of the truck, heaved the nearly 100-pound pail into his arms and waddled away. It wasn’t until hours later, back in his bedroom in New Jersey, that Nivelo realized the sheer fortune he’d stolen: more than $1.6 million in gold. Nivelo thought once he’d escaped New York City and the clutches of the NYPD, once he’d set foot back in his native country, it would all be over. Julio Nivelo first came to America in 1989, and it wasn’t long before he started pilfering unattended trucks around midtown. Nivelo honed a skill of distracting people during his crimes; he never used tools or violence, just his “rewinding” brain, as he calls it: sharp memory and attention to detail. He’d talk to truck drivers and distract them and take loads off the back of the truck. In the 1990s, it was a lot of laptops, memory drives, floppy disk drives. Then it was jewelry – chains, rings, necklaces – especially around midtown, near Madison or Park avenues. He developed a taste for the luxe. Nivelo loved to put on business suits and ties, expensive clothing. It was hard to let go of the pursuit for the finer things. Career thief Julio Nivelo describes to News 4's Marc Santia how he's stolen jewelry off trucks around midtown in Manhattan for nearly two decades, setting him up for the biggest heist of all: a bucket of gold worth $1.6 million. On Sept. 29, 2016, Nivelo was walking on West 48th Street near Sixth Avenue when he spotted something he’d been waiting his whole career for: a black pail on the back of an armored truck. He’d heard about those legendary pails. Not only that, the truck only had two men working it. Nivelo couldn’t believe it. Normally there were at least four or five guards assigned to the truck. “As soon as I saw the two guys, I did feel like that pail belonged to me. Always I had set up my mind that way,” he said. As soon as one of the guards left, it was just the driver. Nivelo knew how long it would take the departed guard to return. He kept watching the driver. Then, the play: the driver walked away, heading to the cab of the truck to get his cellphone. That seconds-long window gave Nivelo just enough time to strike. Immediately, he was challenged by the weight of the pail, which he figured would be 40 to 50 pounds. It was actually much heavier, about 90 pounds. He knew the area very well -- he just had to make it a little further and he’d be in the clear. Julio Nivelo explains to Marc Santia exactly how he was able to grab a bucket of $1.6 million in gold off an armored truck in midtown Manhattan at rush hour. It was a race against the clock at that point. Nivelo figured he had two or three hours before the company realized it was missing the pail of gold. It was then he realized that there were two gold bars inside the pail. Police at first said that they were gold flakes. Nivelo went home with the gold. He thought he’d maybe find at most $600,000 worth of gold in the pail. The first person he thought of was his fiancée, who recently had a chunk of cash stolen from a safebox in her home, some of which was Nivelo’s. He couldn’t wait to share in the new wealth with her. Nivelo opened the pail and found two big, shiny bars, each at least a foot long. He wasn’t immediately excited. He’d come across bars before that turned out to be gold mixed with other metals. He walked at least 20 blocks to the nearest Home Depot and bought an electric saw and at least a dozen discs. He returned home and spent the rest of the night cutting the bars of gold next to his bed, sweating, feeling the shards of gold pierce his clothing. The next day, he took a small piece of the gold to a friend on 46th Street in the Diamond District. 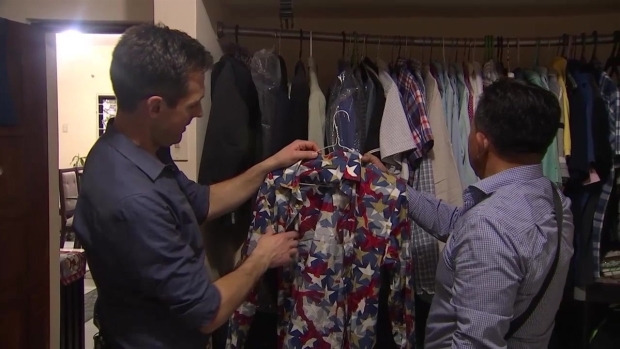 He confirmed it was good quality and gave him $230,000. Nivelo did the math in his head, and realized he had nearly $1.6 million worth of gold sitting his bedroom. He needed to find a money launderer. He called his fiancée and told her, “Listen, I got people who are sending me $1 million, and you send the money out and we have to do investments.” The two talked about buying a house in Spain – Barcelona or Madrid, maybe. Nivelo had known all along that police would be looking for him; there were cameras everywhere in the busiest area of Manhattan. The next day, he cut his hair and put on a suit as he went to meet with the gold dealer, even as detectives were canvassing the area. He returned hours later with stacks of cash, now $1.2 million richer. The cash that Julio Nivelo got on the black market in exchange for the $1.6 million worth of gold he stole. He got a total of $1.2 million in cash. Nivelo first gave $200,000 in cash to his fiancée, as he’d planned. Nivelo then put $600,000 into three shoeboxes, all in $100 bills. The remaining $400,000, made of $50 bills, were stuffed into small bank purses. Now he had to make his getaway before the feds caught him. In fact, he’d been deported three times in the past following prison stints in the U.S. He’d spent a total of eight years in federal prisons, in Fort Dix, New Jersey, in Pennsylvania, in Texas, in California. (Nivelo had also been involved for a long time in smuggling rings, both in the U.S. and in Europe, he said. It’s not clear if he’s ever been convicted in those.) He was always able to sneak back into the country, using stolen passports and various aliases, which explains the multiple names the NYPD initially put out on the wanted posters when they were looking for Nivelo. For now, Nivelo needed to get out. He packed $40,000 in cash and stashed the rest away in a storage locker in New Jersey. He was driven down to Florida, but he knew there was no way he could take a flight out of there. He was staying with a friend, who informed him that there was now a $100,000 reward to turn him in to police. How much could he offer her instead? Nivelo promised her $10,000 in cash if she helped him out. He already could rent a car and drive it, he just needed someone to accompany him in case he was stopped. She enlisted her husband – whom Nivelo paid an additional $5,000 -- and the two men took off from Fort Lauderdale toward Los Angeles. They arrived in California two days after Thanksgiving. Nivelo watched on the news as NYPD Det. Martin Pastor told News 4 in an exclusive interview, “’I will get you, wherever you go.’ He knew my real name.” Nivelo knew he couldn’t stay long in L.A.
“I won. I won. The game is over and I won. That’s it,” he said. 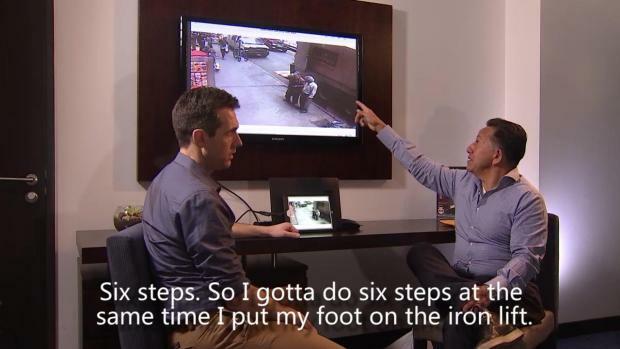 Julio Nivelo, the brazen thief who stole $1.6 million in gold off an armored truck in midtown Manhattan in September 2016, describes to News 4's Marc Santia his daring multi-country journey out of the U.S. and back to his native Ecuador as he went on the lam from NYPD. He was safe from the reaches of the NYPD and the feds in Ecuador, Nivelo thought. 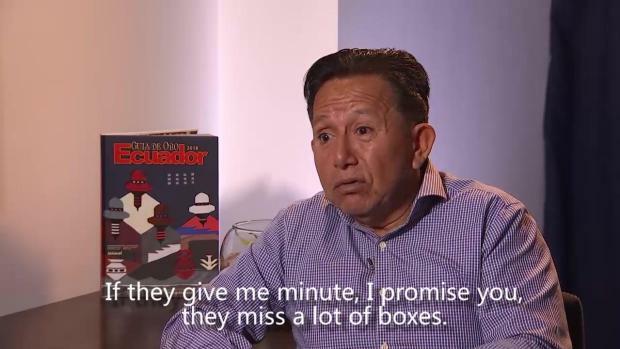 Now all he had to do was wait to get his cash; by then, he'd arranged to have the money-filled shoeboxes and purses removed from his storage locker and turned over to his fiancée. Nivelo had a friend pick him up, and they drove to his mother’s house in Guayaquil, where he couldn’t wait to eat a hot meal and take a hot shower. By then, video of Nivelo’s brazen heist was all over the Internet worldwide, and he was very much a wanted man. But Nivelo simply told his family it was all a misunderstanding, that he was wanted for violating immigration laws. Relieved to be back with his family and no longer in hiding, Nivelo lived a fairly normal existence for about a month. “I wasn’t hiding from nobody because all the problem I left in New York,” he said. Heading to the gym with his brother one day, they went to an intersection in a busy commercial area to grab a cab. Two young men in plainclothes approached and showed their police badges; they asked if he was Julio Nivelo. He confirmed he was. 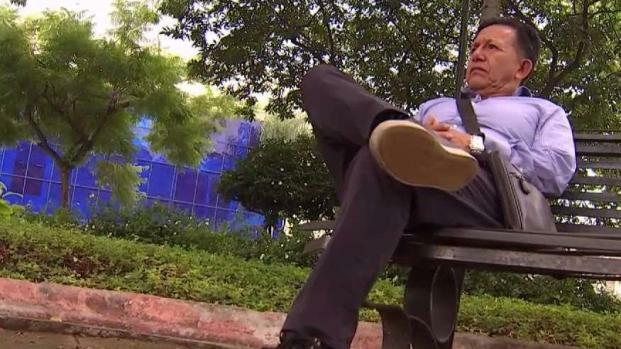 Julio Nivelo in the back of a police car moments after his arrest on the streets of Guayaquil, Ecuador. 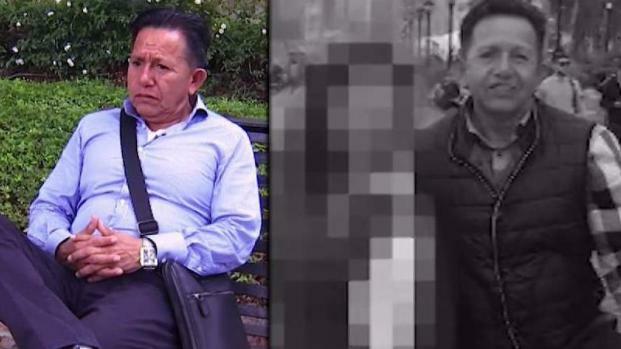 Col. Fausto Geovanny Buenano Castillo told News 4 they’d been investigating Nivelo since they heard he was wanted in the gold theft in New York City: “We cannot allow compatriots to make us look bad out of the country,” he said in Spanish. Once the local police found Nivelo was in Ecuador – made complicated by the lack of any official record of his entrance into the country, since it wasn’t registered anywhere – they moved immediately to arrest him. Nivelo’s lawyer told him there was no fighting it; Ecuador wouldn’t extradite him back to the U.S., but due to an existing treaty between the two countries, Nivelo would have to serve time for the gold heist. Counting on his clean record in Ecuador, Nivelo figured his time in prison would be short. He got a year, and with good behavior, he was released after nine months. “Listen, if you commit crime, you gotta pay. So I didn’t complain about that,” he said. Returning to Ecuador was never part of Nivelo’s plan. The last time he was deported there, he’d tried making an honest living as a taxi driver, working regularly and living a normal life. But it was dangerous. He was shot in the face by a couple of teens while they robbed him for a cellphone (he said he can’t see out of his right eye as a result, and a scar is visible on his cheek). It wasn’t worth it, he thought. But now, he’s trapped 16 to 18 hours a day in a $300-a-month rental with his mother in Guayaquil, lonely, fearful, and missing his three adult children in the U.S.
With his notoriety as “The Golden Boy,” and everyone believing he is rich, his mother had to sell her restaurant and her home for fear of being kidnapped or threatened, according to Nivelo. “I want to be peaceful,” he said. 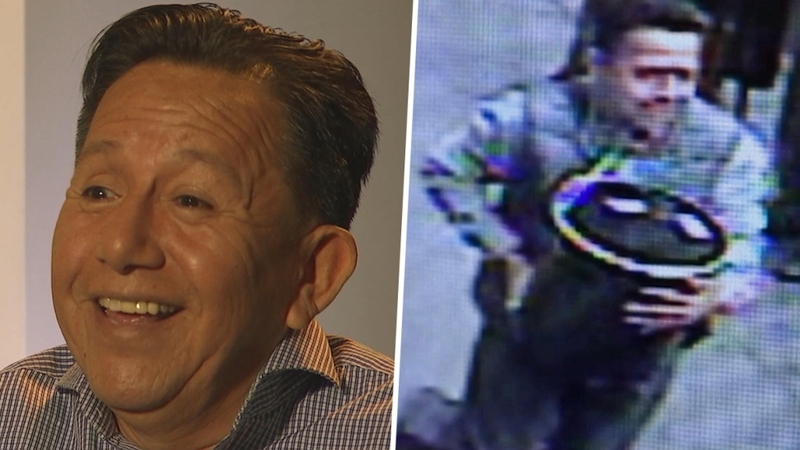 Take a look at how the so-called "Golden Boy" is living back in Ecuador after his infamous heist of a bucket of gold off an armored truck in Manhattan in September 2016. So where’s the rest of the $1.2 million? It’s a mystery that involves jilted ex-lovers and greed, if you believe the words of a career crook and admitted liar. Nivelo insists his now ex-fiancée kept his money and won’t give it back. That woman had been in another longtime relationship with a man she called her husband (even though they weren’t technically married), of which Nivelo was aware. When Nivelo called her in December, her husband took the phone and cursed him out, Nivelo said. Nivelo felt betrayed. The ex did end up sending Nivelo $50,000 – which he calls insulting – and in subsequent overseas communication via letters (they avoided speaking on the phone for fear of being monitored by police), she insisted to him that police had executed a search warrant in her home in New Jersey and took the cash. The NYPD has declined to comment on any of Nivelo's claims in his interview with News 4, citing an open investigation into the case. They did confirm he's cooperating with them from Ecuador. Less than 24 hours after Nivelo described his falling-out with his fiancée in a conversation with News 4, he got a call he never expected. When he picked up the phone, the voice on the other end was a very familiar one. She was in Ecuador and told him she wanted to see him. She promised to find a spot where they could meet, and said she would call him back. News 4's attempts to reach the woman were not successful. She has the money, Nivelo insists, but he’s given up on any hope of getting it back. He’d rather now see the entire experience as a learning opportunity – at 55 years old, better late than never, he thinks. And Nivelo still maintains the cash is very, very close to where he stole that fateful bucket of gold. “The money is back in New Jersey,” he said. Julio Nivelo describes his jaunts across the city in the month following his brazen heist of the $1.6 million worth of gold in Manhattan. 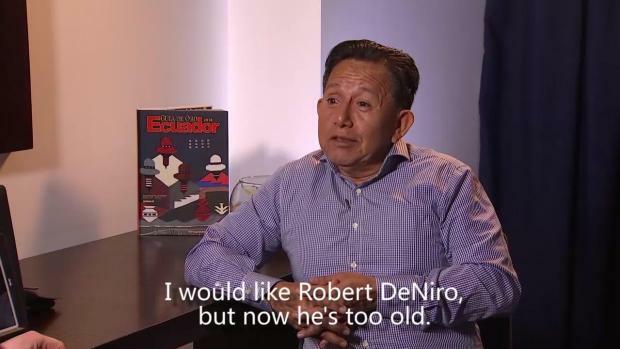 Julio Nivelo knows definitively and decisively there's one actor who should play him if his life were ever turned into a movie.